← Shopping For Crane Dump Hoppers? How To Find The Best Deal! Imagine a tool that will transform any landscape into perfect topsoil in a matter of minutes. Imagine too that it can combine the function of four tools into one, effectively replacing traditional screening buckets, bush cutters, landscape rakes, and rock buckets. Consider the simplicity of one simple attachment that fits to your tractor or skid steer and enables you to clear stumps, vegetation, debris, trash, rocks, and even cactus. Now realize that this is more than just imagination. It’s a reality–the reality of our Quick Connect Skid Steer Rock Bucket Rake. This versatile and innovative tractor and skid steer attachment is revolutionizing the way that landscapers, ranchers, farmers, and construction crews clear the land for practical use. In the past, clearing land was always problematic. Crews used a variety of tractor and skid steer buckets and rakes that were designed to remove rocks, vegetation, and trash from land they needed for livestock, farming, or landscape design. These products produced only limited success. Many skid steer excavators removed topsoil along with the debris, creating more work for farmers and landscapers who then had to add soil back to the area they had just cleared. 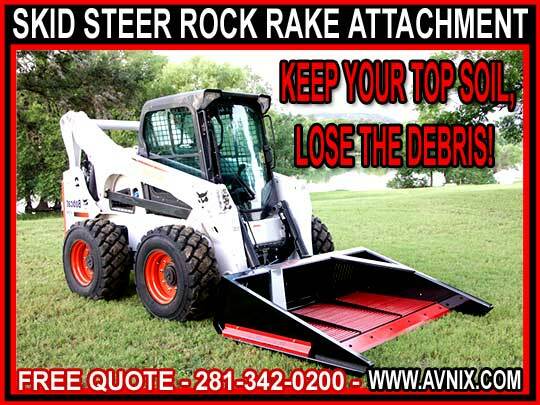 Other skid steer landscaping rakes–designed to preserve as much topsoil as possible– could only remove the largest rocks, limbs, and trash items. This created more labor for crews, who either had to switch attachments to remove the smaller items, or who had to finish clearing the land by hand. 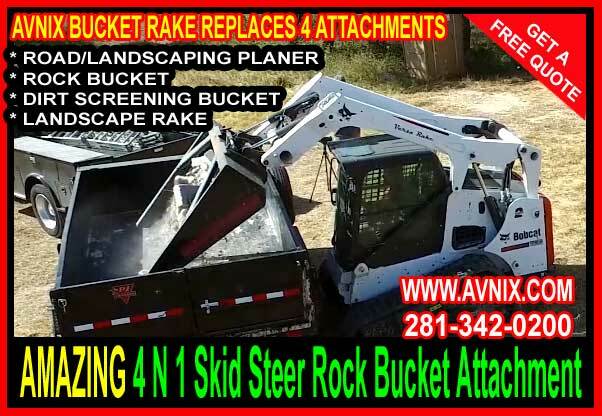 Our quick connect rock bucket rake has changed all of that with a single tractor and skid steer attachment that gets the job done right the first time. Featuring a patented design with removable bars, our quick connect rock bucket rake has proven itself to be one of the most effective land clearing tools on the market today. Not only can it clear an area in record time, but it can also be used to spread materials as well. Unlike other skid steer excavation tools, our rock bucket rake will not dig into the ground. This makes it more than a debris removal tool. It also makes it a spreading tool. 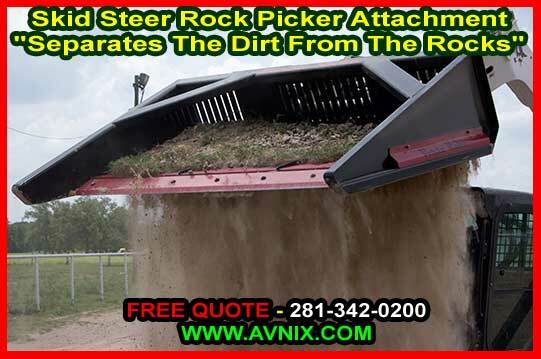 Due to its highly adaptive connection, the Avenix rock bucket rake can be used in many indoor environments dedicated to the care and housing of livestock. A number of local rodeos are now using our attachment to spread soil in their arenas. Stable managers also love our bucket rake because it can connect to tractors and spread soil inside spaces too small for other rakes and buckets. Construction crews use our rock bucket rake for cleaning up debris and trash from the job site. This conserves man-hours previously devoted to manual trash pickup, and it makes for a safer work environment overall. Also, using the attachment as a spreading tool keeps transit areas free of potholes so trucks and forklifts can maneuver easily around the yard. Some crews even use the attachment to spread road base, gravel, and other materials over heavily travelled traffic areas. 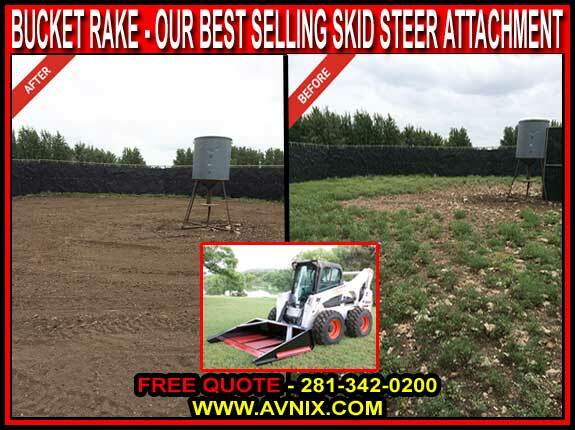 Many landscapers-both residential and commercial- are now using our quick connect skid steer bucket rakes as all-purpose landscaping tools. After removing rocks, limbs, and other debris from the area, they can quickly adjust the distance between bars and use the attachments to spread out gravel for hardscape foundations, seating areas, and pathways. The bucket rake’s unique ability to even out soil also makes it ideal for preparing large garden areas ready for planting. 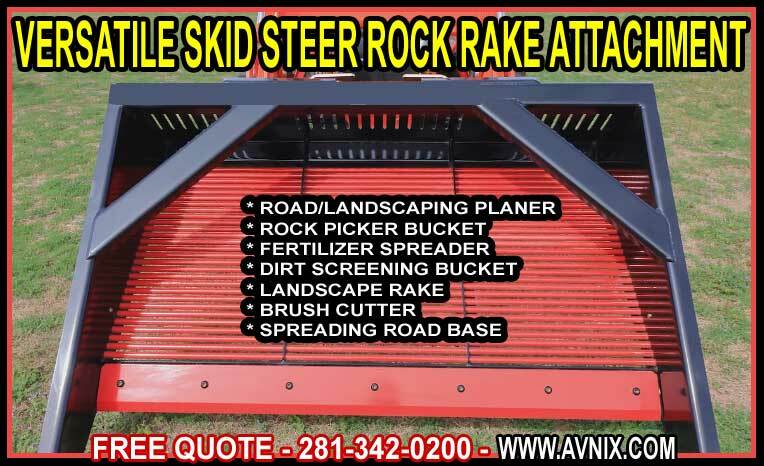 Our quick connect tractor and skid steer rock bucket rake features an all steel assembly and is made in the U.S.A. With screen bars that are easy to replace and a 1 year warranty on the assembly, you have a multi-purpose tool that will deliver years of reliable performance in any landscape or agricultural environment you need to clear for use.